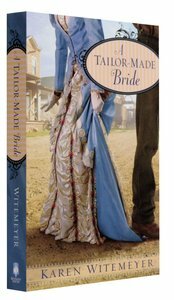 Customer Reviews For "A Tailor-Made Bride (Brides Of Texas Series)"
Just like Karen Witemeyer's other books, I enjoyed how this novel combined fun and light-heartedness with a thought-provoking Christian theme. 'A Tailor Made Bride' makes great, easy holiday reading. Hannah Richards is fun and entertaining from the beginning. She grabs you and you want to know more about her, so you keep turning the pages! J.T Tucker is a grump with a large heart to do the right thing but not fall in love!! The mystery of human attraction!?! Karen Witemeyer is a writer that I really enjoy. Her stories hold humour, reality and great characters. Life is explored and overcome. I know you'll love the Brides of Texas series. A thoroughly enjoyable novel, Karen Witemeyer has produced a page turning storyline with characters that are both likeable and human. The story is a refreshing change from other novels I've read, in that the characters are introduced, developed and extended throughout the book. I do like how she's managed to tie in all the loose ends and it makes for an enjoyable read which I have read again and again. Karen shows her ability to incorporate great research in the making of this novel, and it's provided unique mannerisms for her female character, especially. The only negative for this book, like others in Karen's library, is that it ended. I thoroughly enjoyed and would recommend it to anyone interested in historical Christian romance fiction. Four brothers. Four straws. One bride. Despite the fact that Travis is no longer the gallant youth Meredith once dreamed about, she determines to stand by his side against the enemy that threatens them both. But will love ever be hers? Or will Travis always see her merely as a short-straw bride? Four brothers. Four straws. One bride. Despite the fact that Travis is no longer the gallant youth Meredith once dreamed about, she vows to stand by his side. But will love ever be hers? Or will Travis always see her as merely a short-straw bride? Karen Witemeyer is a deacon's wife and mother of three who believes the world needs more happily-ever-afters. Her book A Tailor-Made Bride was honored as one of the Best Western Romances of 2010 by the Love Western Romances website and was nominated for a RITA Award and National Reader's Choice Award. Karen lives in Abilene, Texas, with her family. Visit her website at wwwkarenwitemeyer.com.